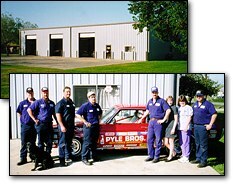 PYLE BROS started in 1978 with two young hot rodders and a factory new candy-apple red Ford Stepside. Tuning engines and drivelines attracted a lot of attention (some good and some bad). In those days a gear change involved a hunting trip to the local junk yard in hopes of finding a treasured N-Case 4.30 Detroit Locker. The daily bag, in reality, was usually a 3.50 or 3.70 from a tired old pick-up; a traction lock was a diamond in the rough. Axle spline count was a matter of luck and there was a good reason it was in the junk yard in the first place. This trial and error approach necessitated a better method of achieving the desired ratio and traction. If money wasn't a factor, and you knew what you wanted, finding someone to install a gear (successfully) was difficult; locating the right parts was impossible if you didn't work at the Ford dealer. Add to this the fact that salvage rears were heavy and greasy with sharp edges. Invariably, the one you wanted was in the mud under two other cars at the back of a mosquito-infested ten acre lot in LaPorte, Texas: Then it still had to be installed! What a learning curve! Enter PYLE BROS...Our customers can pick up the phone or use our convenient Web site to benefit from our research and development. Today's axles, gear sets and attending hardware are the finest quality ever produced; our mechanical talent and experience are combined with the right parts to create superior craftsmanship. We are the largest light duty gear distributor in Texas, and our parts and services are second to none with dedicated employees who have years of experience to their credit. For additional information please contact us at pylebros@pylebros.com.